He was intimidating, commanding, and inspiring in the first-year torts course, where he could make 160 first-year students squirm in unison. He could also inspire truly extraordinary levels of class preparation (i.e., serious study of the law). Nearly a dozen of us would hang out with him after most classes in a semicircle around the podium, asking this or that, seeking a bit more from him, trying to impress him. In his advanced torts and casualty insurance seminars, he was respectful, demanding, and encouraging. Many of us felt like associates in Jim’s law firm, with Jim acting as a mentor. He turned the class over to us, with carefully crafted assignments we were required to address orally and in writing. And pretty much everyone rose to the challenge and performed like a lawyer. He was patient, attentive, and personable in discussions in his office. He didn’t waste time, but he always had time. He valued intelligence and candor. He could respect, in a serious and deep way, those with whom he disagreed. In social settings, he was a natural leader who was, in turns, gracious and challenging. Jim was capable of great warmth. 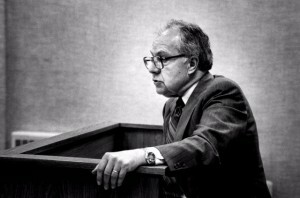 Marquette lawyers who studied under Jim knew their tort law. Many became—now are—leaders of the bar in the torts field. I could name names, and if you’re a torts lawyer, you probably know them. Jim did it all. Powerfully effective teacher. Widely respected scholar. Incisive lawyer. Manager of lawyers. Leader of the bar. Lawyer for the university. Leader of the faculty. And, stunningly, a Yooper (fair disclosure: I grew up below the Mackinaw Bridge, in Jim’s term, a troll). Henry Adams said, “A teacher affects eternity; he can never tell where his influence stops.” To corrupt one of Jim’s favorite phrases: perfectly true, perfectly general, but, in Jim’s case, perfectly meaningful.